A supernova is what happens to a star in the final stage of its life, having passed through all other forms of flaming orb and suddenly reappeared in the night sky with explosive fanfare. 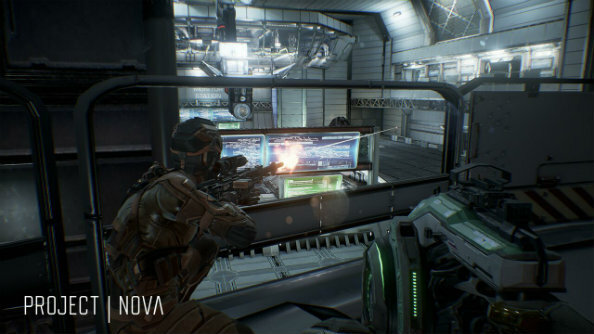 The newly announced Project Nova no longer resembles Dust 514, the PS3 Eve shooter that preceded it. Nor is it quite Project Legion, the later attempt to port that game to PC, whispered about at Icelandic Eve Fanfests for years. 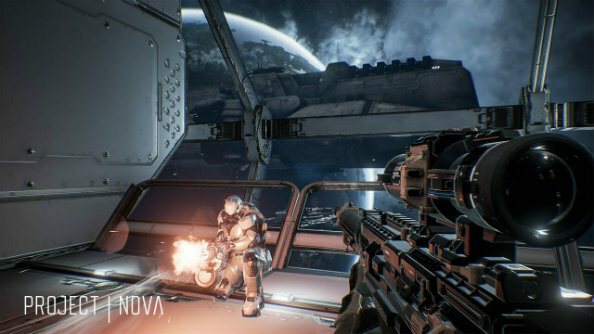 What was once sold with widescreen dreams, of Battlefield-like battles and orbital strikes ordered from a separate-but-connected MMO, is now in its final form a taut corridor FPS. For now you’ll have to settle with what’s in our list of PC’s best FPS games. Nova is only tied to Eve insofar as its demo map takes place on a Chimera-class carrier. The spaceship’s databanks are filled with information worth billions to your employer, if only your team of “immortal mercenaries” can reach each terminal in turn, defend it while a virus bypasses the carrier’s security protocols, and fend off a rival party after the same ISK payday. That is to say: you must run between control points on an indoor map made up of ramps, chokepoints and balconies, defending your position with sniper rifles and railguns to accumulate points until one side or other wins the match. To understand how CCP could swivel so profoundly from the broad ambition that characterises Eve Online to the sort of tight, iterative FPS you could see on Early Access, you have to go back to Eve VR three Fanfests ago – the tentative prototype which, tested by encouraging Eve fans at events, slowly became flagship Oculus Rift launch title Valkyrie. 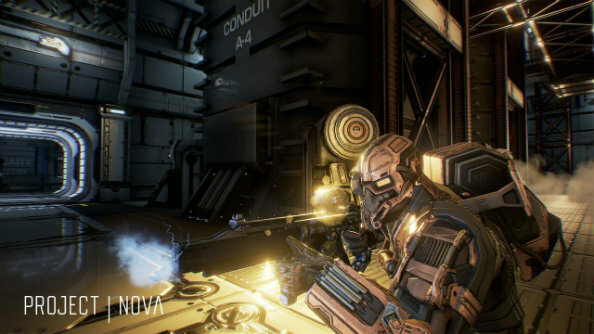 Nova – very much a new game, now in Unreal Engine 4 with plans for free-to-play – is at a similarly early stage. And it feels like it. Not necessarily to its detriment, CCP Shanghai’s shooter is barebones. Although it has six classes, they’re different only by dint of varying hit point totals and altered loadouts: changing combinations of grenades, cloak fields and double-jump jets. What the studio have focused on instead is feel. They’re chasing an unwavering 60 fps, and movement that’s fluid and responsive. The shooting’s certainly immediate – but fluidity doesn’t seem to translate into speed. This is a far more perambulatory shooter than your nu-Dooms or Titanfalls, even with the jump jets, which makes taking and retaining territory a slow and determined process. In the Fanfest demo, control points tended to change hands just once or twice per match – with players forced to shift battle lines only when the game picked a different terminal on the map as its crucial point of conflict. Nova’s most inspired loadout pairings encourage extreme tactical approaches. The Infiltrator’s cloak field and shotgun combo, for instance, allows for devastating, short-lived punches into a team’s defences. But no one class feels unique, and this is a starkly different prospect from the contemporary wave of MOBA-influenced shooters, where each character offers an explicitly different approach to play. I didn’t much think about terminals, viruses, or Chimera carriers while playing Project Nova, so much as the arbitrary objectives of shooters. In fact I was only reminded that this new FPS was part of the Eve universe when assaulting the ship’s bridge – where the chrome sheen gave way to a curved black roof of faraway stars. Where Dust boasted a real, physical connection to the most exciting MMO on the planet – imperfectly implemented though it was – Nova doesn’t yet feel related to the wider world of CCP. CCP have made Nova playable to all at Fanfest 2016, where they’ll collect feedback as they once did for Eve VR. It’s a sensible approach, and a sensible approach can’t match Dust’s breathtaking promises of cross-platform osmosis for excitement. But if Nova’s Shanghai team can follow the new company model set by Newcastle’s Valkyrie, perhaps an Eve FPS will finally yield exciting results.